Most Haskellers would like to use a mature FRP-based GUI. I think FRP may not be the best tool for special user interfaces, like interfaces which consists of buttons, checkboxes, combo boxes, text entries and menus only. I present a prototype lens-based model which fits better these user interfaces. 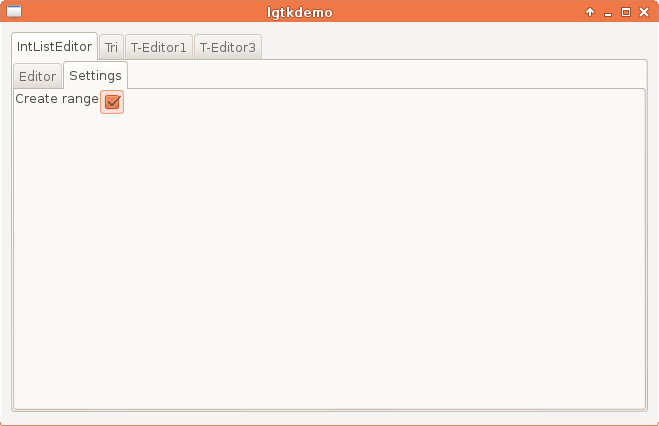 First I would like to show some screenshots of a demo application. It has separate demos in its tabs. While reading the features of the demos, think about how much lines would you need to code these demos in your favourite programming language and GUI framework. The number of entries may vary from 0 to 15. When you add an item, the last item is copied (with its selection state). The value of the added item is either the same, or the previous value plus one. This is a dynamic behaviour which can be changed on the settings tab (see next screenshot). Each item can be deleted or copied individually. The sum of the selected items are shown. DeleteAll and DelSel buttons shows how many items would be deleted. Each button is active only when it has an effect. The last item is always the sum of the first two items. The last edited entry changes. You can edit the shape of a binary tree. 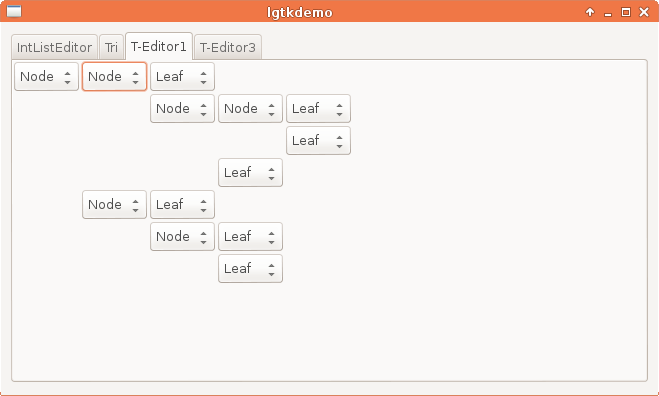 Edited subtrees are remembered, so if you select Leaf and Node again, you get back the previous state. 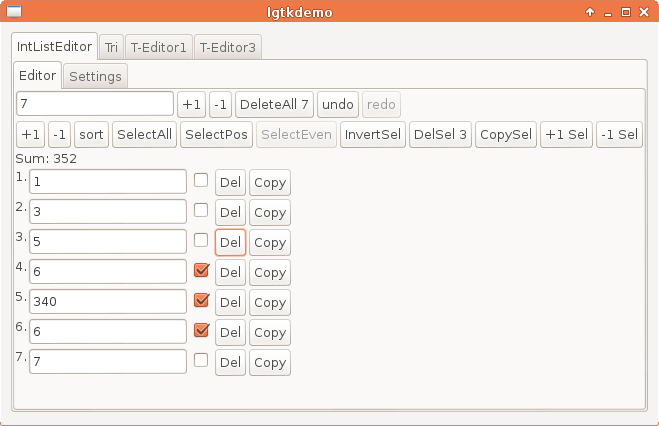 The Int list editor is less than 70 lines in LGtk. I did not count the generic parts, like a generic undo-redo state transformation. 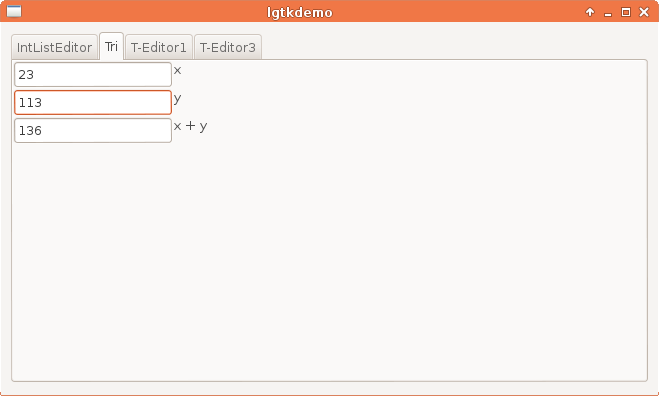 The addition relation editor is 20 lines in LGtk. 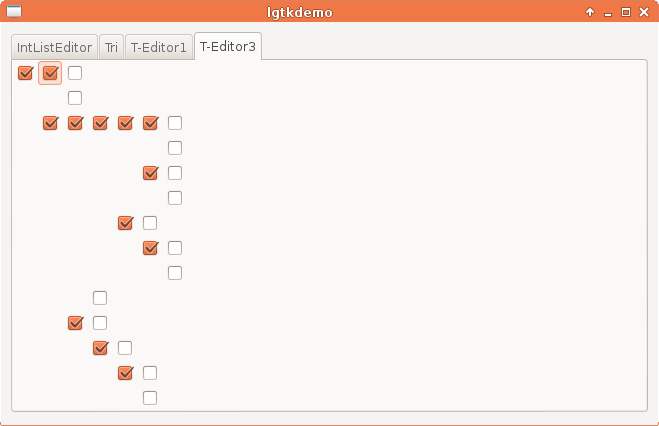 The binary tree shape editor is 10 lines in LGtk. In this way references can easily be composed with lenses. Note that LGtk use lots of impure lenses (lenses which do not fulfil the lens laws). Using lenses which do not fulfil the lens laws are safe, but one should take extra care when doing program transformations or reasoning about code with impure lenses. Suppose that we would like to extend a reference with a hidden state. You can think of this operation as backward application of a lens to a reference. (k . s) behaves exactly as r.
The initial value of s is the result of (readRef r >>= setL k a0). Moreover, (extRef r k a0) should not change the value of r.
It is better to explain this on concrete examples. In the actual interface I use also free monads to speed up the implementation. Would you like to read comparisons to other existing interfaces? Which ones? If you are uncertain whether a concrete simple application can be expressed or not, please describe it. Which other part do you feel uncertain? Do you have scalability / efficiency concerns? Please give concrete examples! If you would use the library, which feature would you need the most?